Carbomer, Cetyl Alcohol, Citric Acid, Cocamidopropyl Betaine, Deionized Water, Imidazolidinyl Urea, Methylparaben, Mineral Oil, PEG 14M, Potassium Chloride, Sodium Hydroxide, Sodium Lauryl Sulfate. Works Well Gentle Expensive Without Insurance Medicine Fragrance I love this stuff! 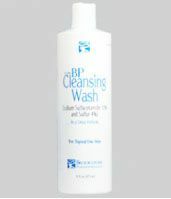 BP Cleansing wash combined with my other products have cleared up my skin completely. I use it twice a day, first thing in the morning and in the evening before bedtime. It is gentle and leaves my skin feeling smooth and clean afterwards. My skin has never looked better and having this as part of my regular routine is definitively a major factor to my clear skin. I highly recommend this product, the only problem may be that it is expensive without insurance (I've seen my exact size 16. fl oz. for $240.00! Ouch!) I got mine for $5.00, so I know I can't go wrong with this stuff. Get it if you can!